Given all the headlines about the struggling economy over the last couple years, it feels remarkably timely to be transcribing documents from the early months of the Great Depression as part of the Greenfield Digital Project. 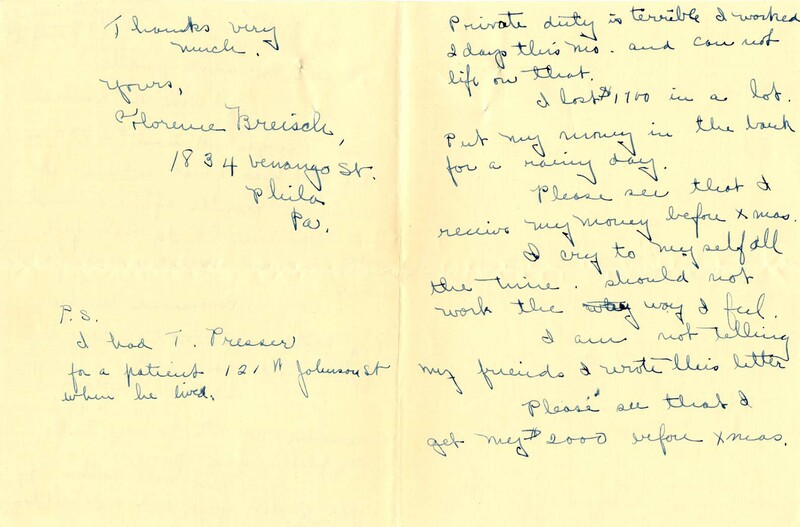 Recently, I’ve been working on letters from depositors of Bankers Trust Company, which became one of the first large banks to fail in Philadelphia when it closed on December 22, 1930. Though the bank’s leaders claimed that it would reorganize shortly, their optimism was misplaced. The bank never reopened for business. For some of those customers, Albert M. Greenfield became a lightning rod for both their anger and despair. 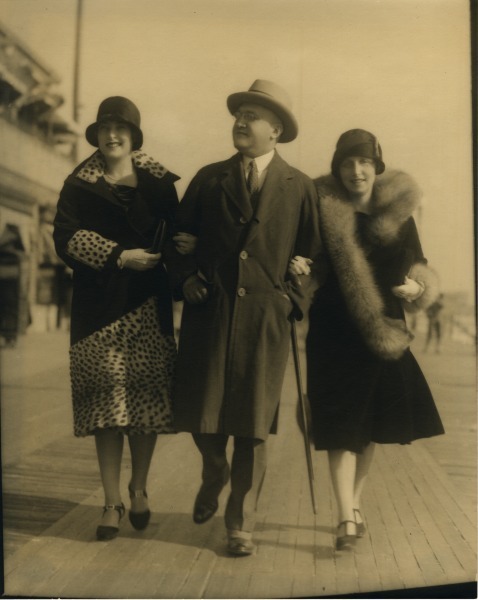 Greenfield was a prominent personality in Philadelphia and a highly visible member of the bank’s board of directors. This anonymous group threatened to kill Greenfield if he did not immediately pay Bankers Trust depositors. According to one scholar, Greenfield hired a police officer to protect himself and his family for a time. But he also received letters from Bankers Trust customers pleading for his help to get their money back. Those letters are heart-breaking not only because of the hardships they describe, but also because we know that the correspondents likely did not receive the relief they sought (at least not from the bank itself). This nurse wrote to Greenfield and his wife asking for help getting her $2,000 before Christmas. She'd had five operations and had been saving the money for a rainy day. 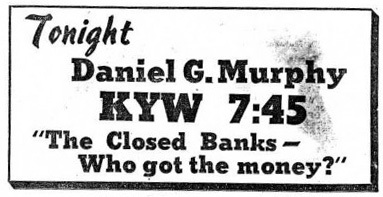 This correspondent offered a brief business proposition to Greenfield: buy out a frozen savings account for a potential $200 profit. 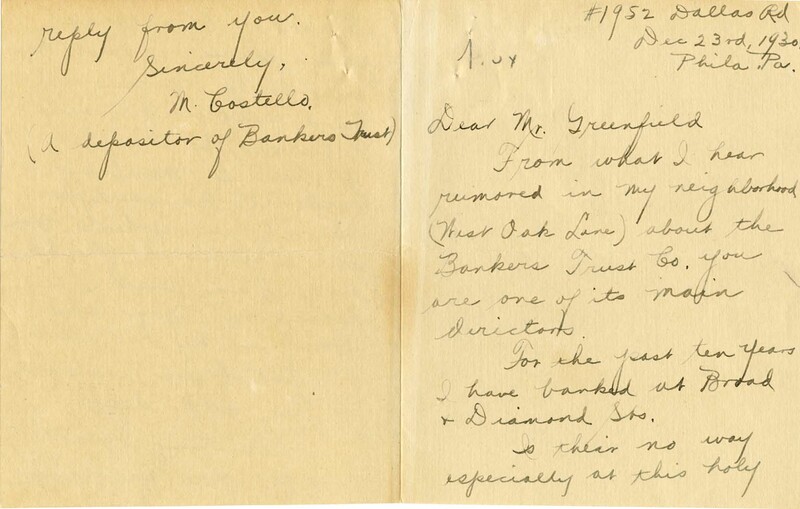 Greenfield’s secretary dutifully responded to each letter, explaining that the situation was out of Greenfield’s hands and that he had no control over who could receive payments from the closed bank. 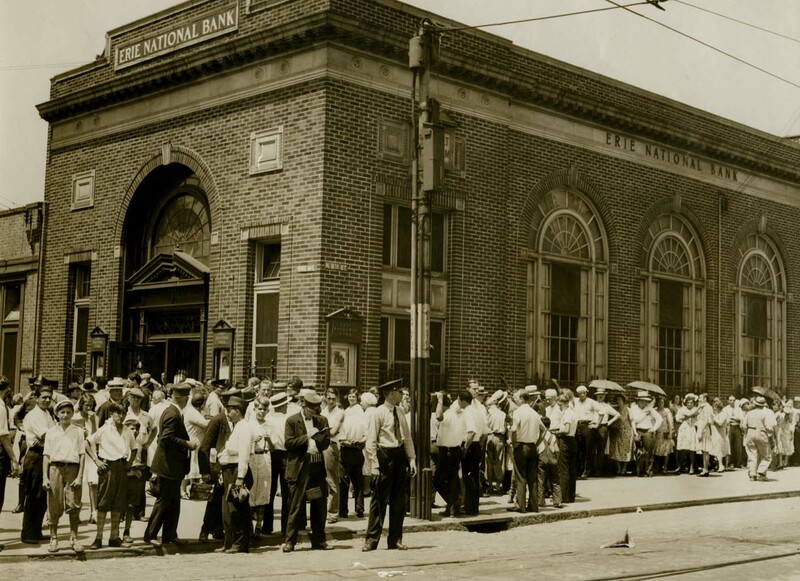 In fact, the Pennsylvania Department of Banking oversaw a lengthy legal process that returned to depositors about 59 cents on each dollar on deposit there. Depositors received their sixth and final payment from the liquidation process in May 1946 – more than 15 years after the bank closed. You can read more about HSP’s Greenfield Digital Project, part of a larger effort funded by the Albert M. Greenfield Foundation, in these past blog posts. Now that we’re elbow-deep in encoding the 300 or so documents for the Greenfield Digital Project, my colleague Faith Charlton and I are spending a lot of time at the keyboard. 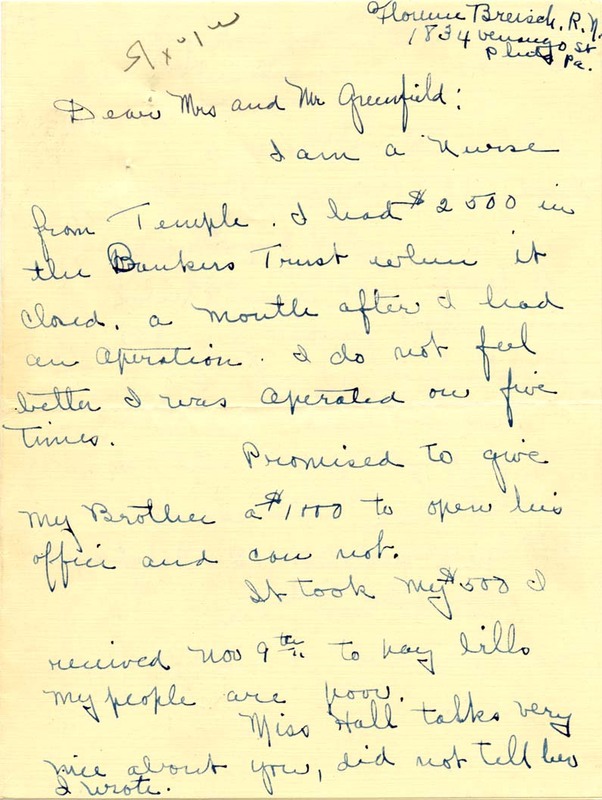 As I’ve explained in past posts, we are digitizing, transcribing, and annotating primary source documents to tell the story of Bankers Trust Company, a large Philadelphia bank that failed in December 1930. This project is part of a larger effort funded by the Albert M. Greenfield Foundation. 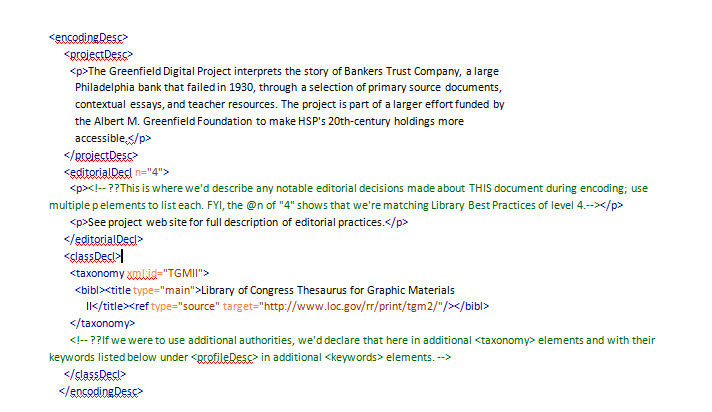 We’ve selected our documents and passed them to HSP’s digital imaging team, and we are now focused on creating our XML text-encoded files. Step one is getting the text from paper to a digital file. One obvious method is simply to retype the text on a computer. That works great for brief documents and is essentially the only option for handwritten documents, where each author’s writing must be carefully deciphered. But we have another tool in our toolbox for longer typescript and print documents: optical character recognition, or OCR. Software programs like ABBYY FineReader or OmniPage can perform sophisticated transformations of digital images into editable text files. For a variety of reasons, I decided it didn’t make sense to invest in that type of software for our project. Instead, when we encounter longer typescript or printed documents in our project, we are using a free tool: Google Documents, or Google docs for short. You can upload .jpg, .gif, .png, or .pdf files to a private storage area, and the system will do its best to translate that digital image file into an editable text file. You can then copy and paste the text into any other software you’d like, including the software we’re using for text encoding, oXygen XML Editor. 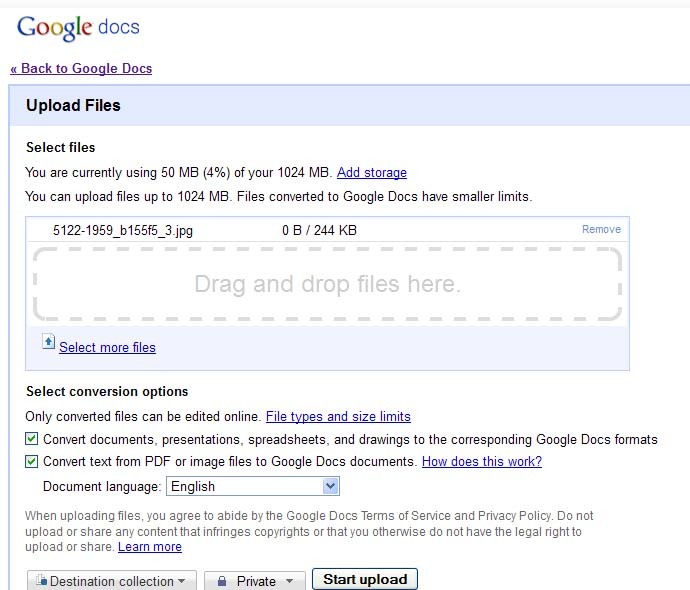 The crucial check-box in the Google docs uploading process is near the bottom: "Convert text from PDF or image files to Google Docs documents." For example, the following four-page letter has about 1300 words total. I could type it from scratch in about 15-20 minutes; Google docs can do the same work in less than a minute. 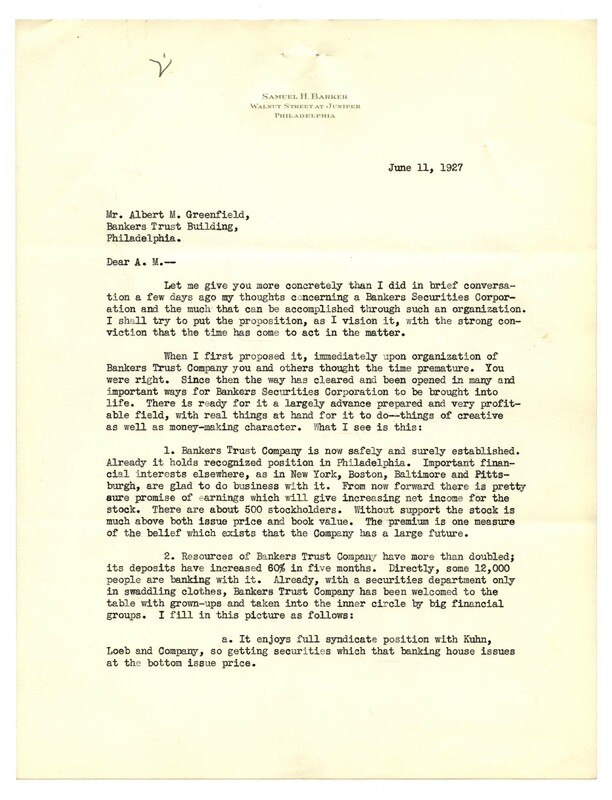 The first page of the digitized letter, in which Bankers Trust Co. President Samuel Barker proposed a new business venture, Bankers Securities Corp.
Mr. Albert Pi. Greenfield, Bankers Trust Building, Philadelphia. Let me give you more concretely than I did in brief conversation a few days ago my thoughts cmcerning a Bankers Securities Corporation and the much that can be accomplished through such an organization. I s11:’;ll try to put the proposition, as I vision it, with the strong conviction that the time has come to act in the matter. 1. Bankers Trust Company is now safely and surely established. Already it holds recognized position in Philadelphia. Important financial interests elsewhere, as in New York, Boston, Baltimore and Pittsburgh, are glad to do business with it. From now forward there is pretty sure promise of earnings which will give increasing net income for the stock. There are about 500 stockholders. Without support the stock is much above both issue price and book value. The premium is one measure of the belief which exists that the Company has a large future. Loeb and Company, so getting securities which that banking house issues at bottom issue price. If you compare the original and the transcription carefully, you’ll see that Google skipped the printed letterhead at the top of the page and had problems with the recipient address, salutation, and first paragraph. But overall, it made relatively few mistakes. Of course, both my typing and the Google docs transformation require careful proofreading. Google often skips over text that confuses it, and it seems to do worse if there are multiple styles of text on a page (like the letterhead and typescript above). It also has a hard time distinguishing between typescript 3s and 5s, among other issues. But for our purposes, these shortcomings are a fair tradeoff for the price. 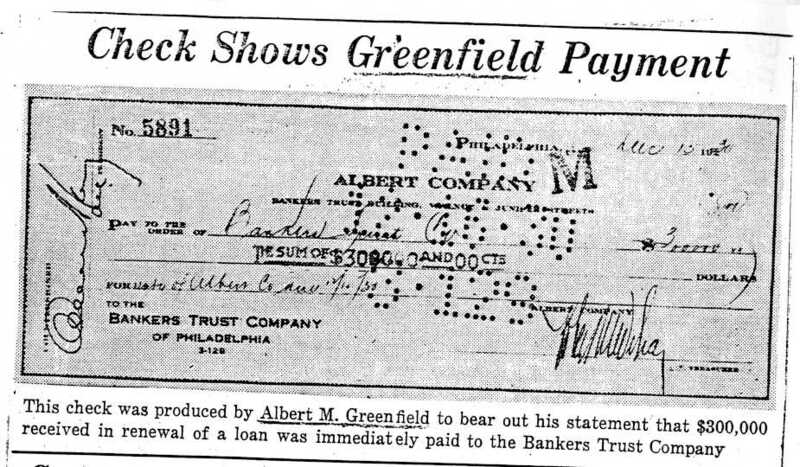 About 90% of materials that will be included in the Greenfield digital project on the Bankers Trust Company of Philadelphia come from the Albert M. Greenfield Papers (collection 1959). The other 10% include items from other collections here at HSP that also provide information about the bank. 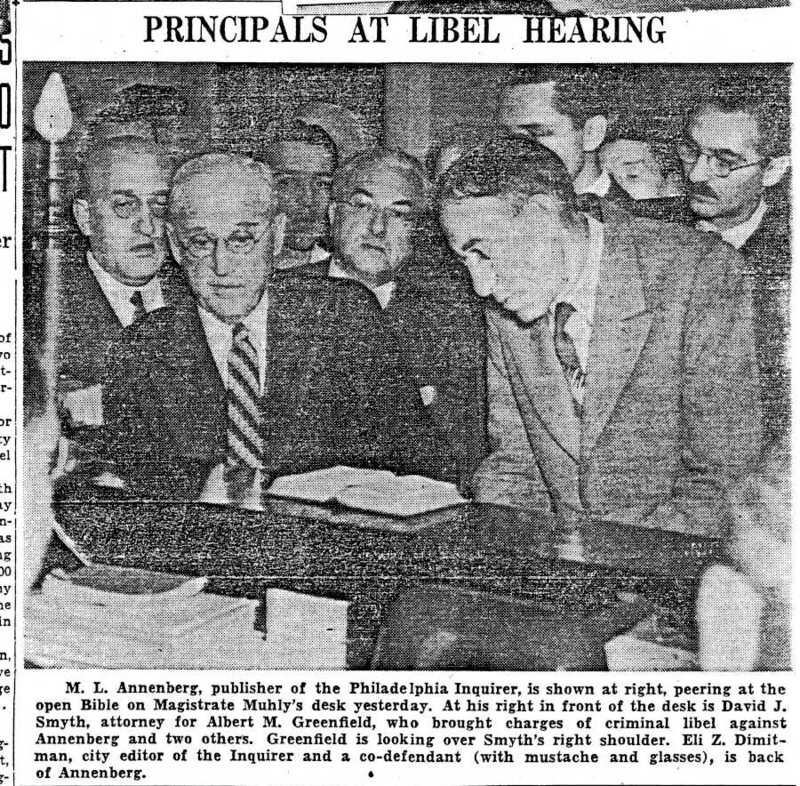 One such collection that Dana and I have decided to use is the Philadelphia Record news clippings morgue (3344). 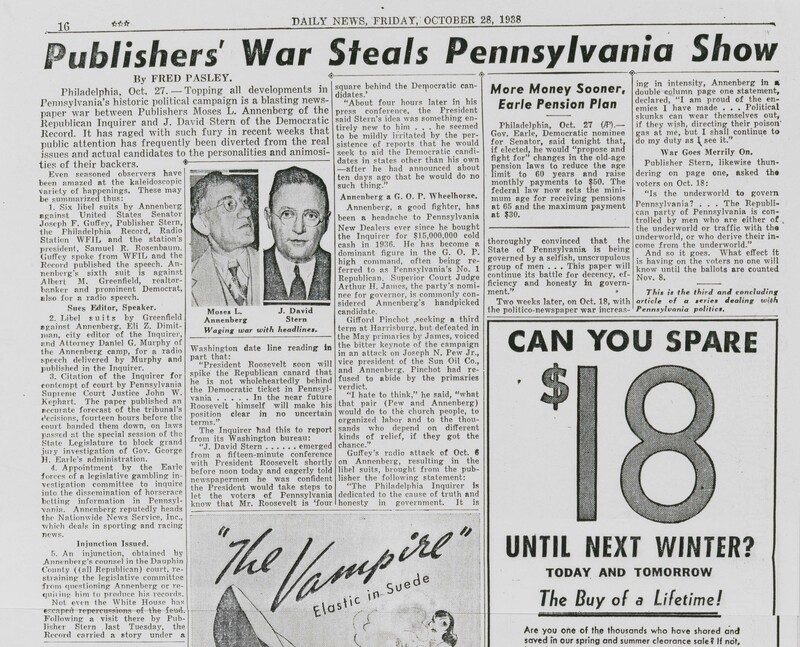 Like Temple’s Urban Archives, which owns the Evening Bulletin clippings morgue, HSP holds the clippings morgue of the Record, a Philadelphia daily newspaper that ran from 1877 to 1947. This large collection, dating from 1918 until the newspaper ceased publication, could potentially provide a wealth of information for researchers. However, its current condition makes access an issue. 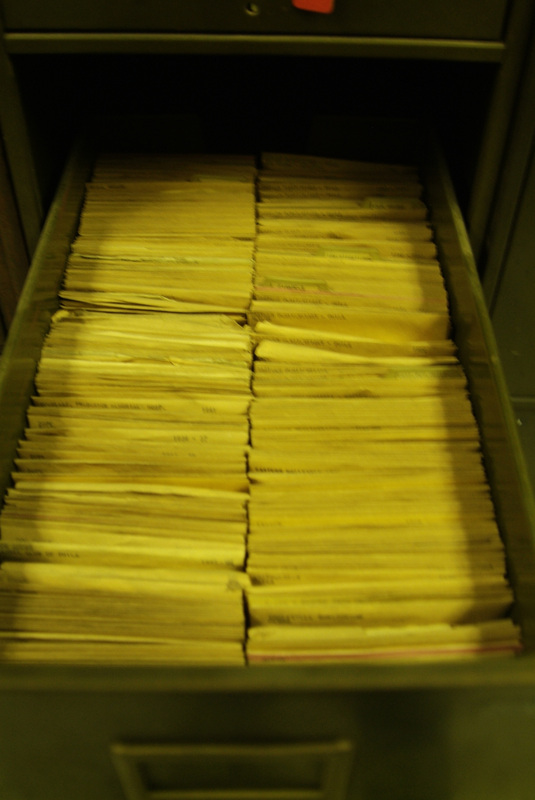 The clippings, folded and contained in envelopes, are housed in about 30 filing cabinets and 30 cardboard/wooden drawers. Although the clippings are organized by person and subject, no subject guide or inventory currently exists. And the clippings themselves are extremely brittle. Dana and I thus had some issues to deal with in using the collection. 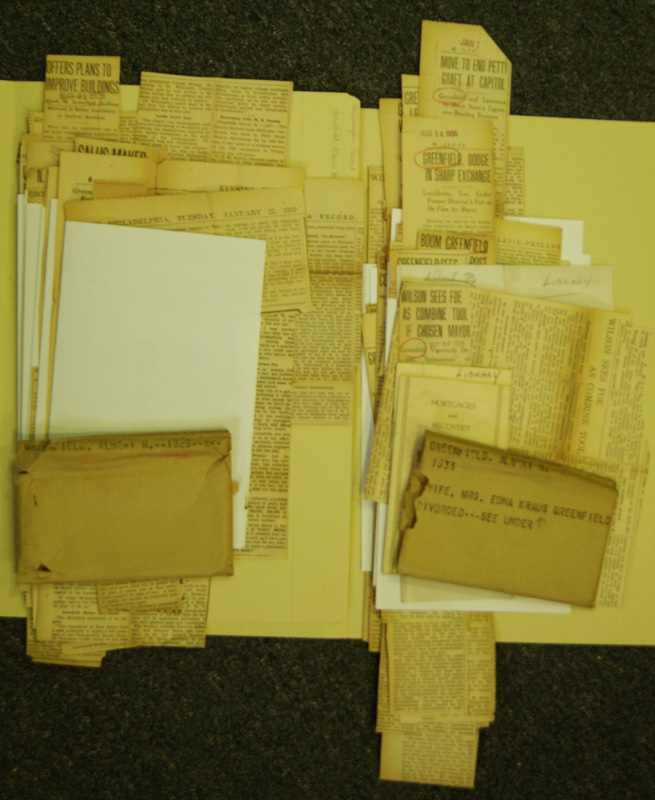 The approximately 25 envelopes of clippings relating to Bankers Trust Company that we pulled were given to Conservation. The staff humidified and flattened the clippings so that we could make preservation photocopies of them onto archival quality paper. These copies of the articles are those that we will digitize for the project. These newspaper articles not only enhance the information found in the Greenfield Papers by offering a human side to the story, but also help to fill in gaps concerning the story of Bankers Trust. As I mentioned in my previous blog post, one of these gaps deals with the failed efforts to reorganize the bank and its subsequent liquidation. 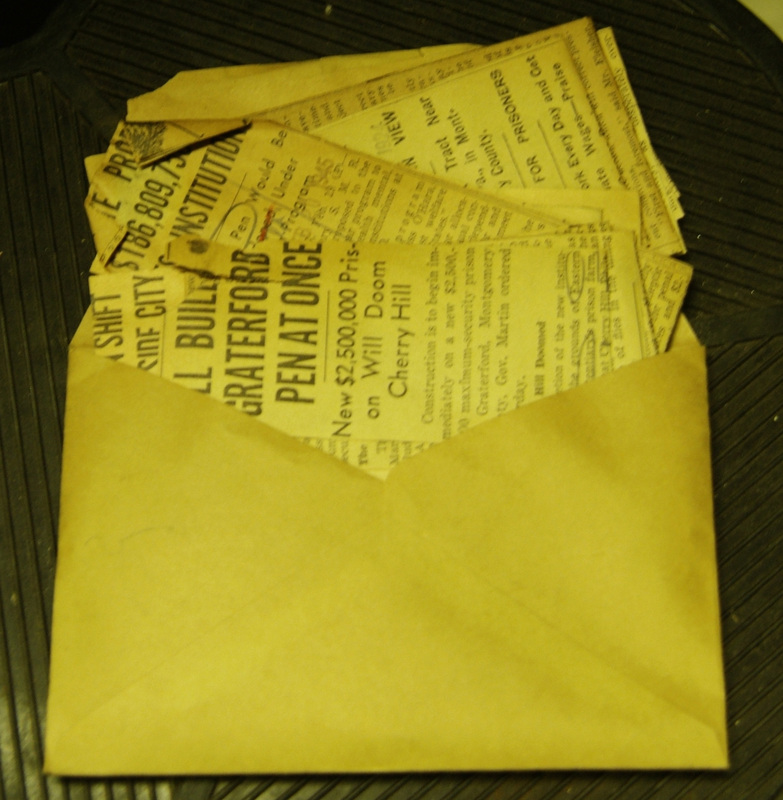 Articles from the clippings morgue have given us a much better understanding of this period in the bank’s history. 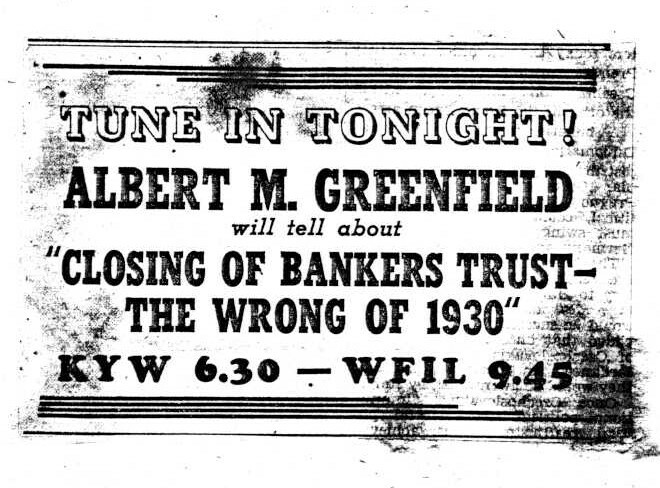 Although articles from the Record clippings morgue will provide key information, one factor that Dana and I, and researchers, need to keep in mind is the paper’s potential bias on topics relating to Greenfield and Bankers Trust. Albert M. Greenfield played an integral role in the newspaper’s history, including serving as one of its primary supporters and financial contributors. Over the last few months, I’ve been spending a lot of my time focused on a fairly technical topic: text encoding. Basically, text encoding is a method for representing text in a digital form. It allows you to record information about text — for example, whether it is handwritten, or mentions someone’s name, or is the salutation of a letter — right alongside the text itself. And it’s a key component of our new Greenfield digital history project, part of a larger effort funded by the Albert M. Greenfield Foundation. 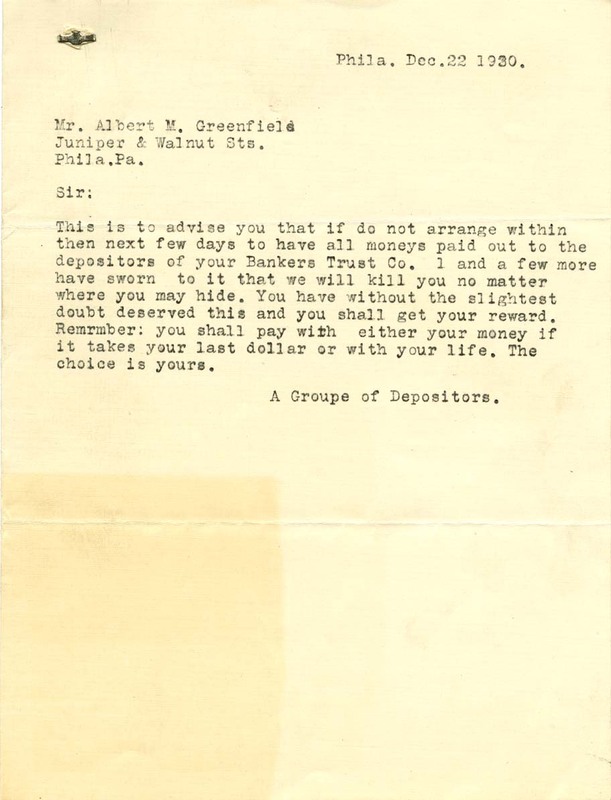 As I’ve described in previous blog posts, we are digitizing, transcribing, and annotating approximately 300 primary source documents from the Albert M. Greenfield papers (collection 1959) and other collections to tell the story of Bankers Trust Company, a large Philadelphia bank that failed in December 1930. We will be coding each document in XML following the encoding guidelines set out by the international Text Encoding Initiative (TEI). We will present these documents, contextual essays, and teacher resources online in the fall of 2012. So what does text encoding look like? We will be encoding much more information than just dates in our Bankers Trust documents, from the physical appearance of the text to its structure to its intellectual content. Once we have completed coding, web users will be able to tackle sophisticated searching and analysis of the digital documents. I’ll keep you posted on our progress. February 4, 2011 by Cary H.
I’m posting this on behalf of our archival volunteer Caitlin Stopper –CM. As an intern that is currently working towards an MA in American History at Rutgers-Camden, the archiving world is new to me. Working with Willhem Echevarria in the archives department at the Historical Society of Pennsylvania has been invaluable in helping me to broaden my education, yet focus my career interests. 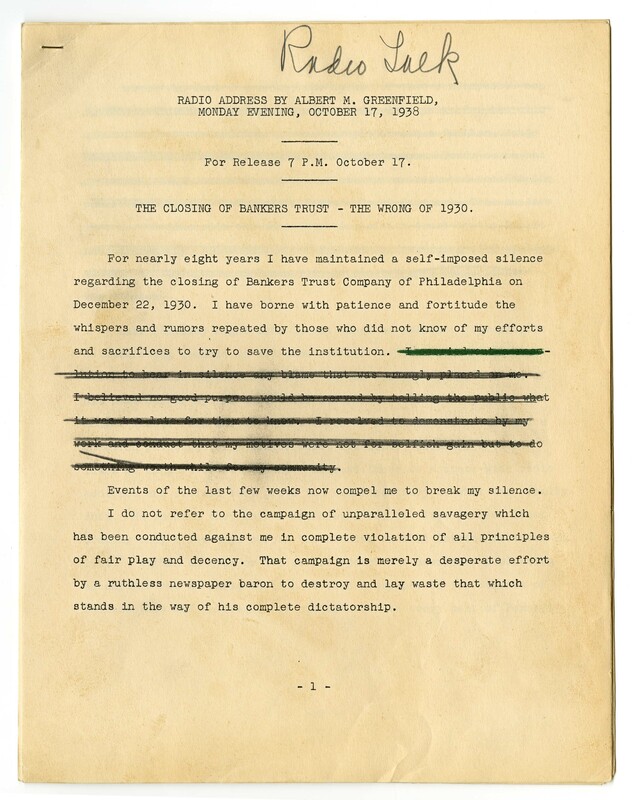 Our current project, Albert M. Greenfield Papers (Collection 1959), is fairly straightforward; re-house and re-number previously archived folders and create a new finding aid, but the project is not without its roadblocks or frustrations. The record cartons that previously housed Albert Greenfield’s filed papers left the contents vulnerable to tears, creases and general deterioration. Willhem and I are carefully examining and reorienting the contents of tens of thousands of folders, and over-sized items are being removed. Each of these over-sized items will receive their own custom folder and filed separately. The way in which some items are organized is puzzling to us, and the original finding aid does little to cast some light on the issue. Many items were found in folders labeled “correspondence” that were unrelated to correspondence such as newspaper clippings and brochures. There are also curiously labeled folders that contain items that are unrelated to the folder title. The new finding aid that Willhem and I will create once the re-housing portion of the project is completed will be more researcher-friendly. Researchers that are currently working with this collection may have concerns about the new location of particular items, but rest-assured, there will be a cross-reference made between old and new box numbers. 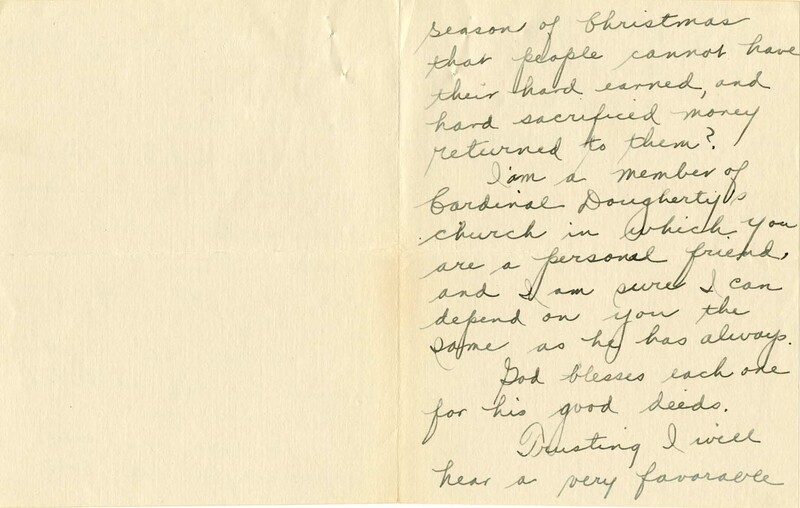 A “More Product, Less Process” approach to archiving this particular collection has certainly not meant a minimal amount of work – Greenfield’s collection originally filled 547 boxes and is now housed in approximately 1,200 letter-sized archival boxes. Our work has certainly been cut out for us! I began working on the Greenfield project back in November while Willhem was on leave and found myself overwhelmed with the sheer amount of boxes whose contents needed to be re-archived. Upon Willhem’s return, we streamlined my modus operandi into an even more efficient method of tackling the task at hand. Two sets of hands have certainly proved to be better than one. 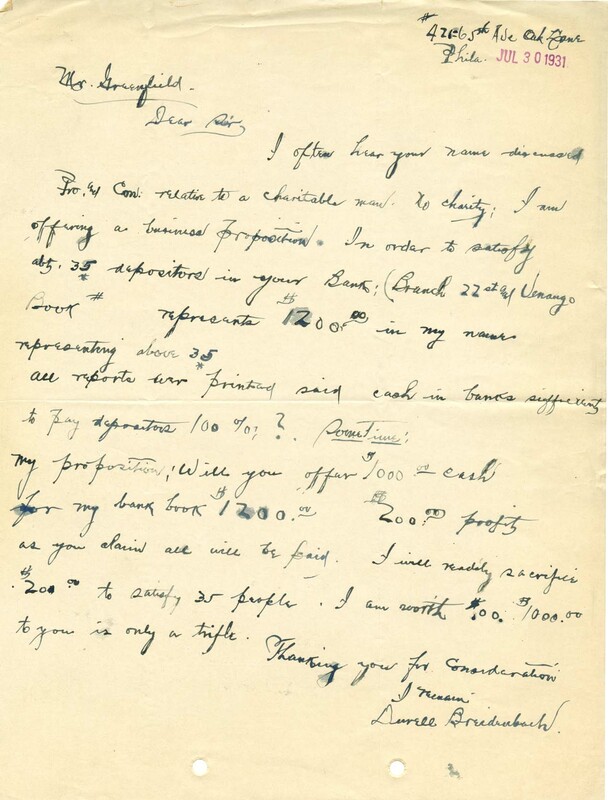 The Albert M. Greenfield Papers online finding aid will be available to researchers and the public at the end of February.